Uilleann is an authentic sounding full set of Traditional Irish Uilleann Bagapipes that is played like the real instrument. 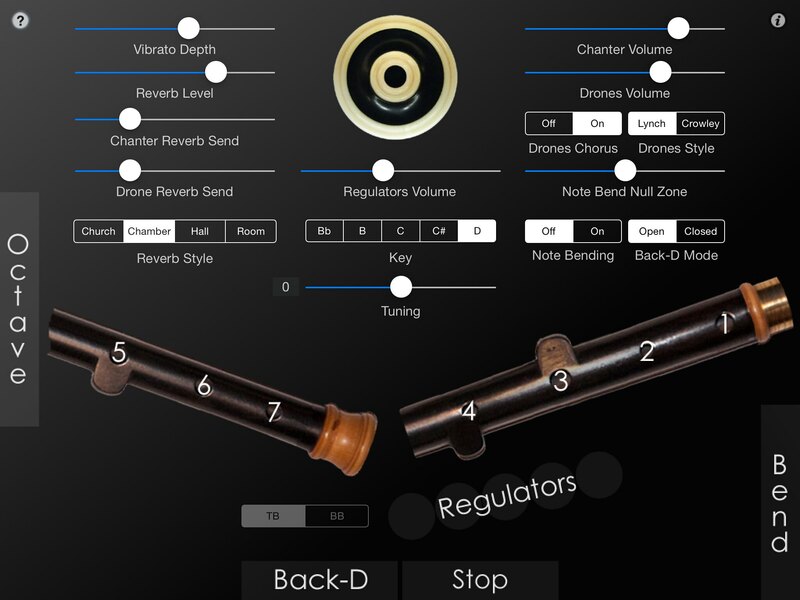 The app emulates the chanter, three drones, and regulators of a full set of Uilleann pipes. It plays in all the traditional keys of D, C#, C, B, and Bb, and is fully tuneable as much as +/- 50 cents. 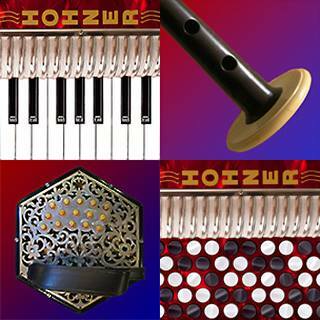 The app supports both open and closed piping styles, traditional finger vibrato, and note bending effects. Touch the '?' icon at the upper left corner of the main screen to show/hide the help labels. Touch the 'i' icon at the upper right corner of the main screen to show/hide the controls. Touch the drone puck to start/stop the drones. To play the chanter, touch the three holes of the left side of the chanter starting with the tips of your left index, middle, and ring fingers. Next, touch the four holes on the right side of the chanter with the tips of your right index, middle, ring, and little fingers. Touch the green "Octave" bar on the left side with your left little finger to play the notes one octave higher. The regulators are played with the right thumb on the circles between the right side of the chanter and the bottom control bars. Use the Regulator Volume slider to set the balance of the regulators against the chanter and drones. The regulators use the same Reverb Send setting as the chanter. Optional pitch bending of the chanter notes is done by first turning on "Note Bending" in the controls, then sliding the finger up or down very slightly on the root tone hole for the note or simply tilting the finger as one would do on the actual instrument to half-hole a note. Touch the blue "Back-D" bar at the bottom left center with your left thumb to play the second octave "Back-D" on either a press or release based on the setting of the "Back-D Mode" control. Touch the red "Stop" bar at the bottom right center with your right thumb to stop the chanter sound when all holes are covered for staccato closed piping techniques. Touch the purple "Bend" bar on the lower right with your right little finger to bend the pitch or play finger vibrato. You may also perform finger vibrato on the chanter for most notes with the right middle and/or ring fingers. All settings are saved when closing the app and restored the next time the app is run. For students of the Uilleann pipes, the app supports nearly all of the alternate fingerings for most notes and can be used as a real practice chanter for the instrument. All 128 possible fingerings have been mapped as closely as possible to match the real instrument. Sound is based on high quality per-note chanter and drone recordings from my personal sets of Uilleann pipes. Connect your MIDI chanter first using a hardware MIDI interface, then launch the Uilleann app. Touch the MIDI icon on the lower left corner to set the MIDI channels and bottom-D lowest MIDI note for your MIDI chanter. MIDI channel and transpose settings are saved on exit. For the drones, sending any Note On message (Note number less than 80) on MIDI Channel 15 from your hardware MIDI chanter will start the drones, and the matching Note Off message for the start note will stop the drones. The app responds to MIDI Pitch Bend messages on the Chanter MIDI channel. Pitch bend response is based on a two semitone maximum bend range. The "Note Bending" switch also determines if MIDI Pitch Bend messages will change the pitch. Turn it on to get MIDI Pitch Bending. The regulator pairs now may be played on the MIDI channel one higher than the chanter starting on MIDI note 60 (C3). Q: The sound stops when I put 4 fingers on the screen. A: Since this app requires as many as 9 fingers on the screen at the same time, before playing, disable "Multitasking Gestures" on your iPad (in the Settings app, under the General section, turn the Multitasking Gestures switch to the off position). Q: Are the fingerings the same as a real Uilleann pipes chanter? In the app, touch the "Octave" bar on the left side to indicate an octave jump. Back-D is played by touching the "Back-D" bar at the left bottom center with the left thumb. Using the "Back-D Mode" control, you can choose between whether the Back-D bar plays the second-octave D note on a touch or release. Q: Is there some way I can do finger vibrato on the second octave Back-D? A: Yes, there are two ways. In "Open" Back-D mode, you can touch the "Back-D" bar on the bottom left center, then lift your right hand and do vibrato with your middle finger. The other way, in the newest version that has note bending, is to bend the C or C# up to D and then use the middle finger of your right hand for finger vibrato. Q: How is per-note pitch bending done? A: First make sure that pitch bending is enabled by bringing up the performance controls and making sure that it is enabled. Pitch bending is done by sliding the finger up or down very slightly on the root tone hole for the note or simply tilting the finger as one would do on the actual instrument to half-hole a note. The width of the "Null" zone where no pitch bend will occur may be adjusted with the performance controls. Q: Where can I learn more about how to play the instrument?